Start with killer chilaquiles. Before touring the nearby , pick up a spot of grub and a shaft of sunlight. Both can be found at , a Mexican no-animal-protein zone set in a charming alleylike patio just off Main Street. The avocado tacos are no joke, but if you’re craving something in the “I can’t believe this is vegan” category, look no further than the hearty chilaquiles: homemade tortilla strips piled with housemade salsa, black beans, guacamole, and convincing mock chorizo. Check out the art scene. When the famously fertile copper mines of Bisbee went dry in the mid-1970s, a wave of eclectic artists splashed into town to replace the pickax crowd. Today, the two-block crescent of Main Street just west of the Copper Queen Hotel is home to roughly a dozen art galleries, none more exciting than . The sweeping brick walls are covered with work by local artists, and include everything from landscapes in acrylics to abstract wall art forged from copper. Proceeds benefit the Renaissance House, a nearby transition project for homeless women, who fashion the gallery’s inventory of colorful Adirondack chairs. Throw back a throwback beer. 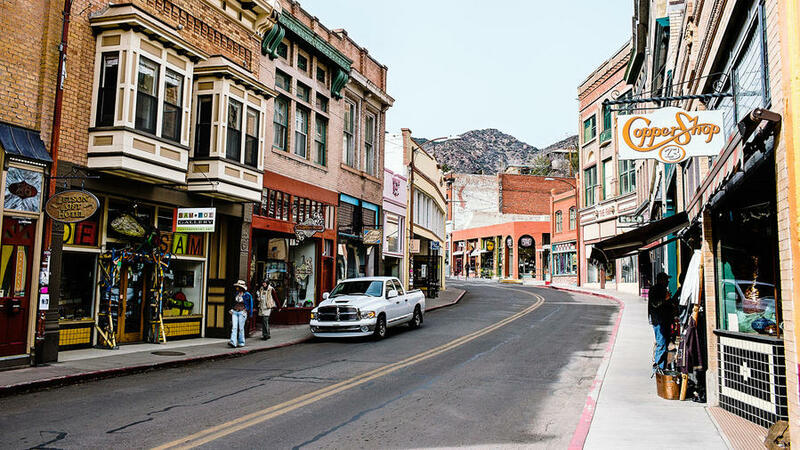 During its precious-metal heyday, Bisbee was known as “the liveliest spot between El Paso and San Francisco.” Cheap beer from the Midwest eventually put local suds-smiths out of business. But , launched in 2010, aims to resurrect the days when brewers made their own liquid gold. The brewery shows a half dozen styles, which you can sample via a tasting flight; we’re partial to the smooth Copper City Ale, a recipe that’s been around these parts since 1881. Pig out on the perfect pizza. Bisbeeites have found ingenious uses for the town’s early- and midcentury buildings. At , owners turned a grubby 1950s service station into a place for the best wood-fired pies in the area code. Standouts include the beautifully charred Margherita Bliss and the fennel sausage-filled Screaming Banshee. Don’t miss the cozy bar programmed with haute cocktails like the Lipstick on My Lover, made with Champagne and elderflower liqueur. Stay for a show. Down the street from Screaming Banshee Pizza, Bisbee’s best music venue, , took over a 1918 Baptist church. The pews were torn out and converted into the bar top, where the “choir” dispenses pilsner and Pinot instead of church hymns. But the crowd remains devout, moved by a canny mix of old movies, alt-rock and folk from Bisbee and beyond.